Come on out, network, get your questions answered. The end users of modern industrial systems are constantly searching for methods of improving the availability and maximizing the efficiency of those systems without compromising the quality of their offerings or safety of their operations teams. One of the areas where improvements can have significant impacts in this pursuit is quite literally staring them in the face; the human machine interface used to control and operate these systems. By implementing improvements in the mechanisms used to control and operate industrial systems, operations teams can significantly improve both the business value and the safety of their industrial systems. Over the past several decades the way people have interacted with industrial systems has changed dramatically. These changes were driven by the needs of the operations staff to improve the way that they use, manage, and maintain those systems coupled with advances in technology that facilitated those improvements. Changes like this will continue to naturally occur over the coming decades and will be driven by market needs coupled with advances in technology that address those needs and provide further opportunities for improvements. There are several trends in the current implementations of industrial automation human machine interface (HMI) systems that are driven by the current market needs. The trends that are currently driving the needs of industrial HMI application design are larger systems, greater volumes of data, increased levels of automation, staffing proficiency issues, and expanded use of remote operations. Each of these industry trends poses new challenges that can severely impact the ability for an operations team to achieve optimal business performance of their systems and safe operations. This paper will discuss how the HMI should be designed to optimize the operator’s interpretation of the vast amount of data being displayed. The cornerstone of improving the overall HMI design is to deliver Situational Awareness (SA). Only by achieving the proper Situational Awareness can the operations team make effective decisions that will deliver overall business success. As industrial processes evolve, so will the design of the HMIs that are used to operate those processes. Instead of asking the operators to focus on a large volume of process parameters, the data will be placed into context to deliver situational awareness. Instead of having the operations staff being viewed as labor resources they will be empowered as information craftsmen that will make key business decisions in real time. Instead of operating in a reactive mode the systems will be proactively managed to extract the maximum business value from those systems. And ultimately the focus of the operations teams will shift from merely operating the process to real time business management. 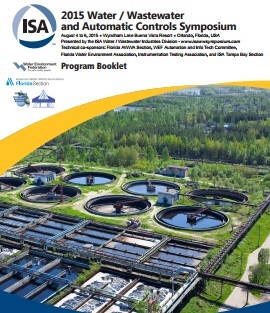 Presented by the ISA Water and Wastewater Industries Division, in collaboration with the Florida AWWA Section, the WEF Automation and Info Tech Committee, the Florida Water Environment Association, and the Instrumentation Testing Association, the WWAC Symposium helps professionals in the water and wastewater industries understand how instrumentation, SCADA (supervisory control and data acquisition), and automatic control applications are vital to the treatment and distribution of water; the collection and treatment of wastewater; and the management of storm water. This 3-day symposium is focused on the challenges associated with automation and instrumentation in the water and wastewater sectors. It features 2 full days of presentations on each day, a tour of a local water/wastewater facility, a general reception, networking events, a poster session, and a supplier showcase. John Krajewski has 19+ years experience in industrial automation and control systems. John began his career working as a Control System Engineer in the potable water industry. Subsequently, John worked as an Application Engineer for a System Integrator who primarily focuses on the pharmaceutical and biotech industries. He joined Invensys Wonderware in April 2000 as a Senior Application Developer in the Product Marketing Department. Shortly thereafter, John assumed the role of Product Marketing’s Functional Manager of Infrastructure. John Spent 5 years as a Domain Architect with responsibilities for architectural and functional definition of InTouch and ArchestrA technologies. For the past 5 years John has served in multiple Product Management roles for Schneider Electric Software HMI/Supervisory Control products.